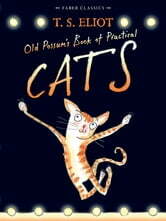 To celebrate Old Possum's 75th anniversary we have commissioned lively new illustrations from Rebecca Ashdown for T.S. Eliot's original book of Practical Cats. Featuring Macavity, the Mystery Cat; Mr Mistofelees, the Original Conjuring Cat; Mungojerrie and Rumpelteazer and all the gang, this is a must for every child's bookshelf and is a great companion to the Andrew Lloyd Webber stage show.